Sleek and modern, the River cuff echoes the currents of water. The soft fluid curves make for a refined statement and the gold chain is a beautiful signature Jenny Bird touch. Crafted out of a single piece of brass, it is dipped in 14K gold with a high polish finish. Rent this with your flirty playsuit, a demure and work-function ready jumpsuit, or a floor-length gown to make a splash at your next night out! Hire this gorgeous piece with a simple gold-accented clutch to give yourself an extra shine. For more outfit inspiration, check out our 'Getting Work Function Ready' blog post! Founded in 2008, Jenny Bird’s namesake label explores an amalgamation between the classic and contemporary. 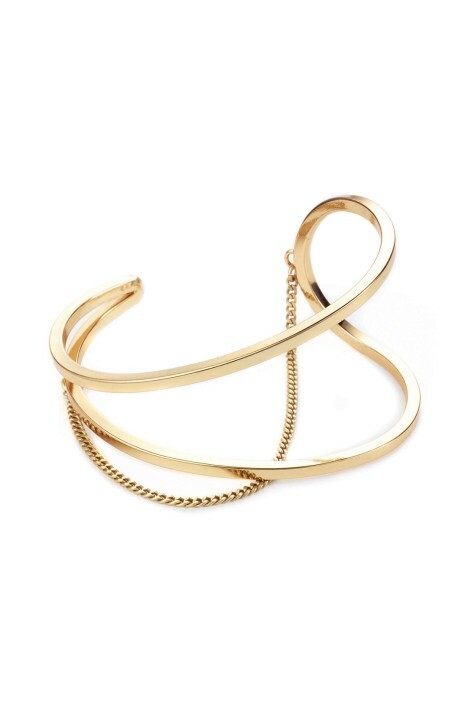 Based in Canada, her modern jewels focus on timelessness with sleek architectural lines that add a signature edge. Crafted to perfection and with a sensibility to quality, her jewellery pieces are made to last and are the perfect complement for any outfit.